When you’re binging on Halloween candy do you ever worry about whether your stash will run out? If you’re a candy company binging on kids' love of sweets during Halloween, the answer is yes. And a major cause of this concern is climate change. The growing consternation candy makers feel about how hotter temperatures, droughts, floods, and other climate change impacts will affect the industry is causing them to study these environmental trends closely. 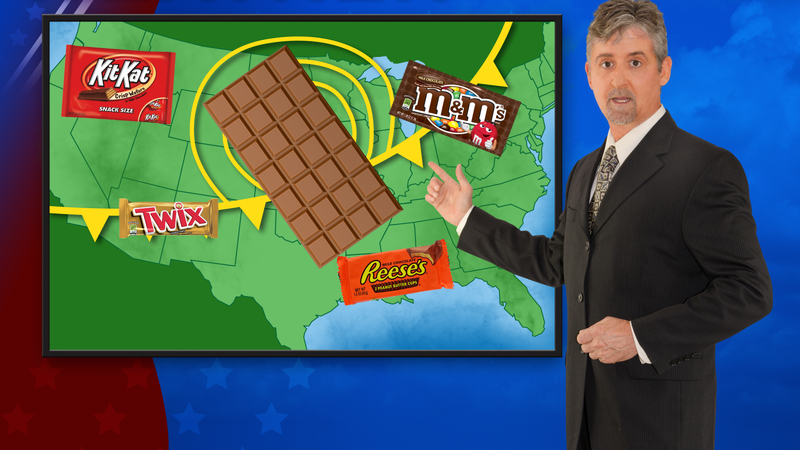 Mars Chocolate, the maker of yummy treats like M&M’s, Snickers, and Dove, now employs several meteorologists who analyze the impacts of weather on the chocolate business. The implications of this research extend all the way into Halloween shoppers’ pocketbooks. This year, the National Retail Federation has been tracking the increase in Halloween candy prices, and has warned that one reason candy is getting more expensive is because of climate change. This is especially the case with chocolate and the cost of cocoa. A group of cocoa industry experts and scientists recently said one of the main challenges the industry faces is climate change. “Rising temperatures and unpredictable rainfall patterns will render some areas of West Africa, which produces more than 70% of the world’s cocoa, unsuitable for cocoa production by 2030, and dramatically change the climates of other regions,” Christian Bunn, postdoctoral fellow at the International Centre for Tropical Agriculture, a global research partnership, recently said at the European Cocoa Association forum. Greg Harnish, VP of Commercial for Mars Chocolate North America, said that while most people think of weather impacting businesses in the short-term, such as with heavy snowfall causing delays, climate change is actually extremely impactful in the long-term. Harnish said the team of meteorologists at Mars analyzes global weather patterns to help the company make the best supply chain and sourcing decisions for their business interests and their consumers’ demands. FoodDive also notes that chocolate is more likely to melt when shipped in warm weather, and the refrigeration costs can become be prohibitively expensive. Mars was the first global chocolate company to commit to 100% certified sustainable cacao by 2020, and Harnish said the company is on the way to becoming the world’s largest buyers of certified cacao with 40% of the company's cacao coming from certified sources last year. And even where certification programs fall short, Hanish remains hopeful that practices will continue to improve with a coordinated global effort. The World Cocoa Foundation’s CocoaAction program brings together chocolate companies like Mars, Nestle, and Hershey, as well as governments and other key stakeholders in an effort to establish a sustainable future for the industry through collaboration and analysis. Liz Caselli-Mechael, a communications manager with Nestlé, said cacao plants have some pretty particular environmental needs. They require a tropical environment with high temperatures and are very sensitive to a lack of water—according to the International Cocoa Organization, rainfall is the factor that most affects cacao production. Nestlé has committed to making sure its products don’t cause deforestation, a pledge that includes raw materials and packaging. Nestlé is also supporting cocoa farmers through its Cocoa Plan by distributing higher-yielding, disease-resistant plantlets to improve productivity and minimize the amount of land required for farming. Aside from cocoa, palm oil is another major ingredient in Halloween candy that demands a lot of land at the expense of other flora and fauna. According to the World Wide Fund for Nature, the equivalent of 300 football fields of rainforest is destroyed every hour to make way for palm oil plantations. Denise Ward, a representative for Hershey, said the company’s Responsible Palm Oil Sourcing Policy is helping curtail deforestation by establishing responsible expansion practices at palm oil plantations. She said that by 2020, the company’s entire supply of palm oil will be traceable back to the plantation level where it can be closely monitored. Hershey is one of the more than 150 companies to have signed the White House's American Business Act on Climate Pledge, which allows companies to demonstrate their support for action on climate change and to submit sustainability pledges. No matter how you dress climate change up, it’s still an unwieldy beast underneath that will require collaboration across borders and industries in the effort to avoid the most catastrophic impacts. At the same time, with proper planning and incentive structures, businesses that prepare for climate change can also prosper in the face of such challenges. This includes the big business of Halloween. In the meantime, the frightening reality of climate change is becoming increasingly clear as temperature records continue to pile up. In years to come this will continue to impact Halloween in scary ways.